Tall and upright with spreading branches covered in flaking gray and tan bark, London plane tree is best known as a tough urban street tree. It is a hybrid between American sycamore (Platanus occidentalis) and Asian planetree (P. orientalis), and was hybridized in England in the middle of the 17th century. 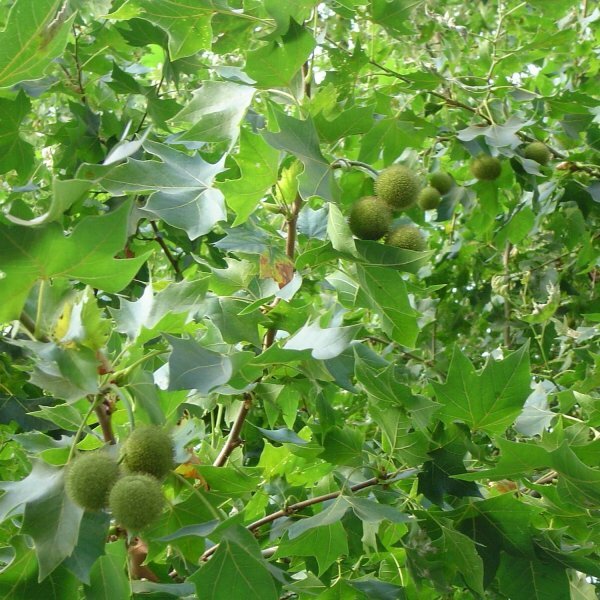 Hybrid vigor makes this hardy deciduous a tough adaptable choice for urban conditions. The large, maple-like leaves of London plane are bright pale green when they first emerge in spring. Clusters of flowers appear alongside the emerging leaves. The inconspicuous rusty salmon blossoms are either male or female. Small, golf ball-sized fruits develop after pollination by wind. 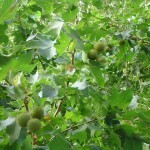 The fruits come in clusters of two to four (rarely singly) and turn from green to light brown. They decorate the branches well into winter and eventually fall and shatter into a puff of fine fibers. Fall leaf color is usually golden yellow accented with tan. The attractive bark peels off in rounded patches in a mosaic of gray, tan, and brown, revealing a smooth almost white layer beneath. 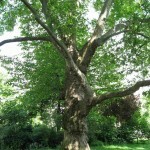 For best growth and stature grow London planetree in full sun and fertile soil that is moist and deep. It also has considerable tolerance for the dry, shallow soils of city tree lawns. It attains a huge mature size, so don't grow it too closely to buildings. 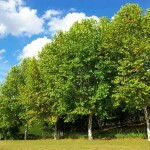 It is a spectacular shade tree for the landscape or spacious avenues. In times of drought, or in regions with long hot summers, the foliage may turn brown in late summer, and become fully dormant and dry by fall. The large dry leaves and fruits are messy and require cleanup. 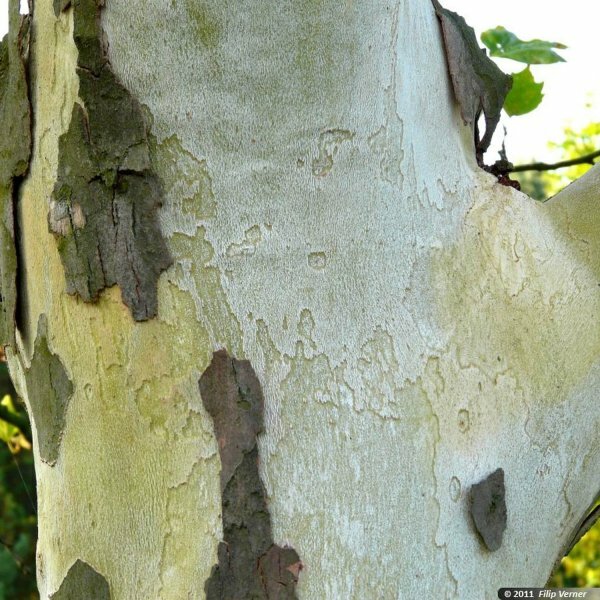 Anthracnose commonly causes leaf and branch drop in warmer months, so this tree can also be messy in summer. Germination 1. Fill a 1-gallon plastic bag with 5 cups of sharp river sand. Drizzle water over the sand while mixing it by hand to evenly moisten it. Bury the sycamore seeds in the moistened sand. Seal the bag. 2. Store the sycamore seeds in the moistened sand for 90 days inside a refrigerator to cold stratify them and prompt germination. Remove the seeds from cold storage once the growing containers are prepared. 3. Dig up soil from the garden bed where the sycamore trees will be planted using a garden spade. Mix three parts garden soil with one part sharp river sand to create a suitable planting mix for the sycamore seeds. 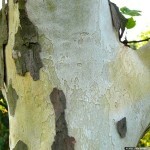 Fill one 10-inch nursery container with the soil and sand mixture for each sycamore tree desired. 4. Sow two sycamore seeds in each pot to a depth of 1/2 inch. Water each pot to a depth of 3 inches. 5. Place the pots outdoors in a sunny spot for the winter. Moisten the soil only if little or no rain falls for a long period of time. 6. Watch for signs of germination the following spring when outdoor air temperatures rise above 65 degrees Fahrenheit for 15 to 20 days. Move the pots to a spot with dappled shade during the hottest part of the day once the seedlings reach 1 inch in height. 7. Thin the sycamore seedlings to one per pot once they grow a set of mature leaves. Remove the smaller or less robust seedling. 8. Keep the sycamore seedlings in their pots until they reach 1 foot in height, then plant them out in a permanent bed with a soil pH of between 4.5 and 6.5.